Prairie Ridge High School held a homecoming block party Friday, October 5, 2012 in Crystal Lake. Homecoming festivities capped off with a home football game against Jacobs Friday night. Jacobs defeated the Wolves 34-16. 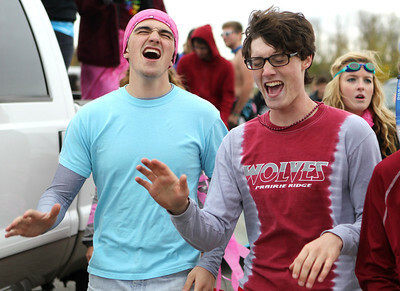 Mike Greene - mgreene@shawmedia.com Seniors Sean Lochmeyer, 17, and Steven Mondloch, 17, sing with members of the Madrigals while returning to campus after a parade during homecoming celebrations Friday, October 5, 2012 at Prairie Ridge High School in Crystal Lake. Homecoming festivities capped off with a home football game against Jacobs Friday night. Jacobs defeated the Wolves 34-16. 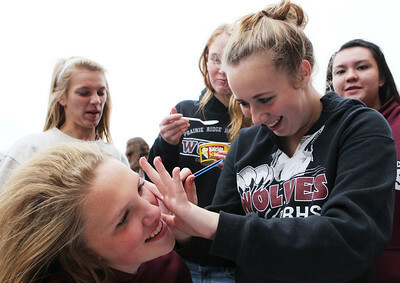 Mike Greene - mgreene@shawmedia.com Freshman Kira Brandt (left), 15, has her face painted by classmate Beth Houte, 14, during a homecoming block party Friday, October 5, 2012 at Prairie Ridge High School in Crystal Lake. Homecoming festivities capped off with a home football game against Jacobs Friday night. Jacobs defeated the Wolves 34-16. Mike Greene - mgreene@shawmedia.com Freshman Addy Kimball, 15, tosses a bag while playing during a homecoming block party Friday, October 5, 2012 at Prairie Ridge High School in Crystal Lake. Homecoming festivities capped off with a home football game against Jacobs Friday night. Jacobs defeated the Wolves 34-16. 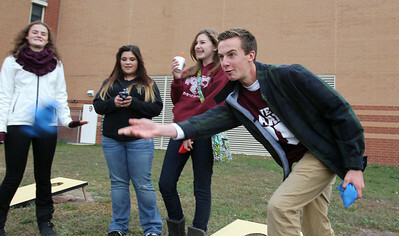 Mike Greene - mgreene@shawmedia.com Sophomore Matt Kenning, 15, prepares to catch a football while playing catch during a homecoming block party Friday, October 5, 2012 at Prairie Ridge High School in Crystal Lake. Homecoming festivities capped off with a home football game against Jacobs Friday night. Jacobs defeated the Wolves 34-16. Mike Greene - mgreene@shawmedia.com Junior Wolves Cheerleader Mackenzie Schmidt, 6, gets free ice cream from Claire Bowman, 16, during a homecoming block party Friday, October 5, 2012 at Prairie Ridge High School in Crystal Lake. Homecoming festivities capped off with a home football game against Jacobs Friday night. Jacobs defeated the Wolves 34-16. Mike Greene - mgreene@shawmedia.com Junior Ryan Sennholtz (right), 17, takes an ice cream order during a homecoming block party Friday, October 5, 2012 at Prairie Ridge High School in Crystal Lake. Homecoming festivities capped off with a home football game against Jacobs Friday night. Jacobs defeated the Wolves 34-16. Freshman Addy Kimball, 15, tosses a bag while playing during a homecoming block party Friday, October 5, 2012 at Prairie Ridge High School in Crystal Lake. Homecoming festivities capped off with a home football game against Jacobs Friday night. Jacobs defeated the Wolves 34-16.